I hope everyone had a Happy Thanksgiving! 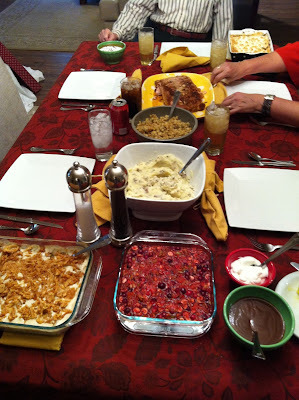 We hosted our first Thanksgiving as a married couple at our new house, and it was wonderful! My mom and I survived some kitchen foolishness to produce some yummy food, and it was wonderful to have my grandpa in town from Tennessee. We ate a lot of food, took some naps, watched a lot of football and did a ton of work on the house! Hubby has been off work for the entire Thanksgiving week, so he was hard at work on various home projects. 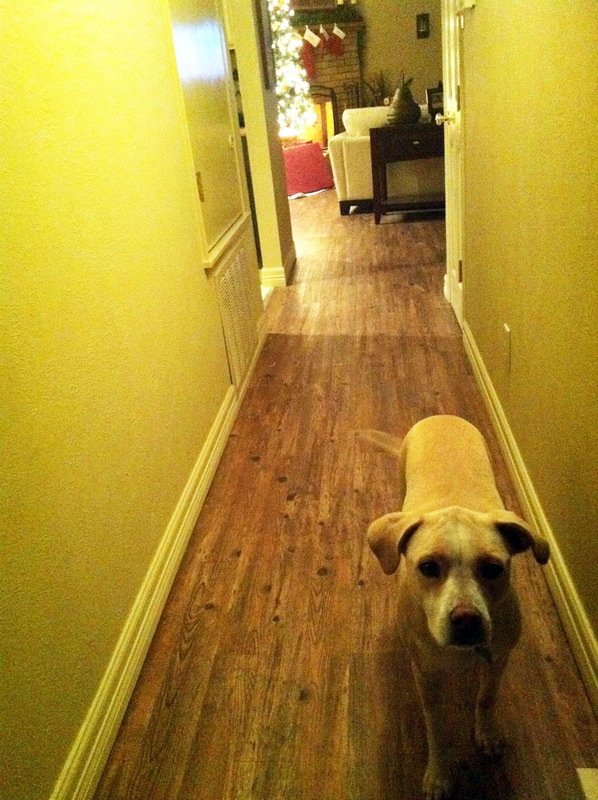 Project #1: He finished flooring the first half of the hallway, and it looks so good! We're going to knock it out little by little until the whole house has new floors. I can't wait to see it all come together, especially when it is uniform flooring throughout the living room, dining room and kitchen! No more cement floors in our hallway! 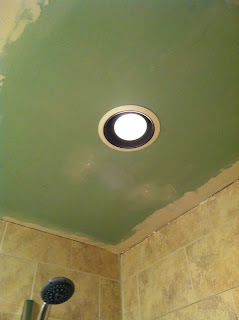 Project #2: Our two bathrooms both had the same problems: no vent and no lighting. It's not accurate to say there was no lighting at all, but the pot lights in the ceiling were the only light source and they were too dim for my taste (bad for putting on makeup, that's for sure). There are no lights in either shower area so it can be very dark when you are showing, and we use a clear shower curtain just so the light from the rest of the bathroom can filter through. 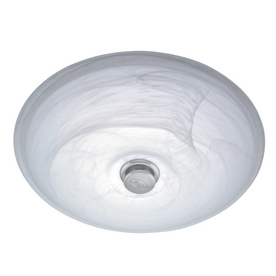 And we all know that vents are an important and necessary part of the bathroom equation, so we needed to add those. 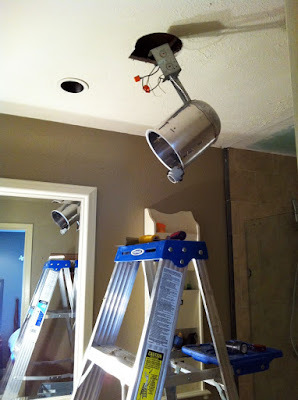 We bought some ceiling lights that double as vents, and the men in the family got right to work on their installation as soon as they arrived on Saturday. 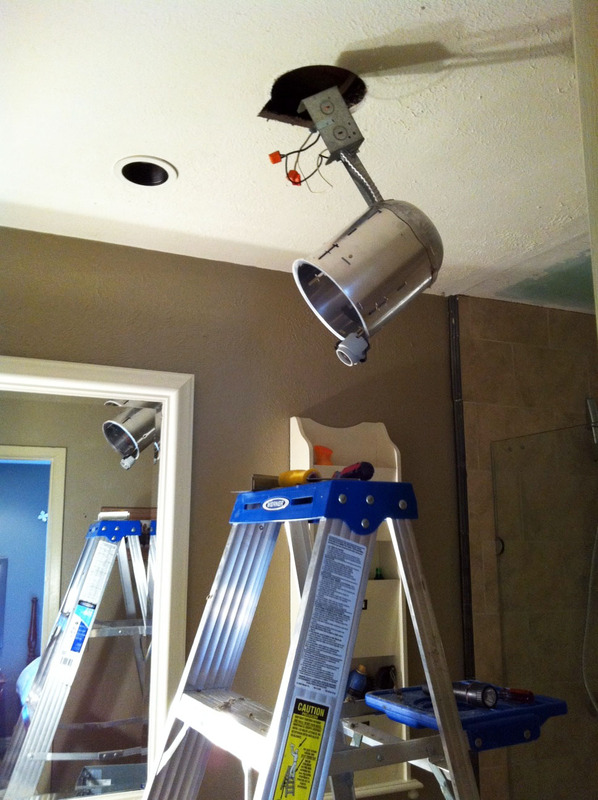 Scott had the idea of replacing the old pot light with the big new vent light and then reusing the pot light in the shower area, which saved us the $160 we had spent on new lights for the shower area. I love it when he has money-saving lightbulb moments like that! The Hubs did all the wiring and was able to accomplish this whole project without having to go up in the attic, which thrilled my dad to no end (I guess he was dreading having to work in the dark attic). These aren't the best pictures, but take my word for it that the difference in the lighting is completely night and day. They added the shower light and the new overhead vent light in each bathroom in a matter of a few hours of work. Impressive! 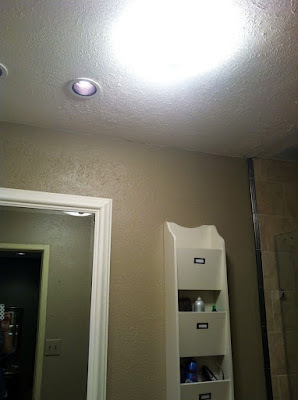 lights in the shower areas of the bathroom makes a huge difference. 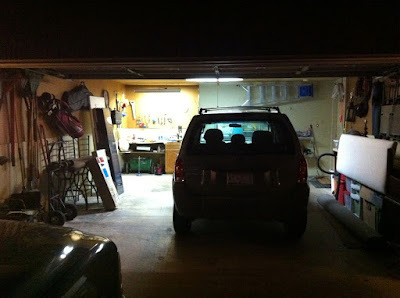 Project #3: We had a garage sale last weekend in hopes of actually parking one of our cars in there, so this weekend the men tackled the garage organization/cleaning. Now my car is parked in the garage, just in time for the cold DFW weather. The weekend isn't over yet! We hit the Black Friday sales today and got some good tools that I'm hoping hubby is going to put to use tomorrow and Sunday. I love holidays!